The overbuilt eyesore of a ‘loft’ — that wasn’t even attached to the house structure anywhere — came down! Our goal for a two day mini-vacation was to get the loft down and then do various other projects in the cabin. Thanks to shoddy construction by the loft-builder, we had it down by noon on day one! It was pouring rain all day, so we spent the rest of the day having a picnic indoors, enjoying the fact that there were no leaks anywhere (! ), and cutting out the bathroom flooring so we can fix what lies beneath. On day two, it had stopped raining so we cleaned up, moved lumber, de-nailed flooring, and laid out tape lines to figure out some design details. A very productive couple of days, and we also enjoyed going out to dinner and staying at the Inn about a mile up the road from the cabin during the interceding evening. Before: the loft looked like aliens flew in and dropped a giant, oversized deck in the middle of the house. All the lumber was oversized, reducing headroom in the loft, and most of the joist hangers were under-sized. Even better, only a couple of the joist hangers were actually nailed into the joists! They were nailed (a little) to the ledger, but the joists just popped right out when lifted. Premature celebration: after the easy removal of all the joists and the front (completely flying!) ‘wall’, the back ledger was a real pain in the bum to remove. All the nails went there, and we had to dig them out with cat claws and hammers to pull the oversized board. Done! All the extraneous mess removed, and vacuumed too (hence, the haze. Yes, we had masks and a hepa filter on the vac). The perfect siting of the house means the sun comes all the way across the living room in winter. In summer, it barely gets onto the front porch. LOVE old construction that involved forethought. Then we cut out the flooring in the bathroom (and de-nailed it for future use). We have some floor re-framing to do, then a new sub floor on top of the old, compromised boards. We went out today (in the freezing, blustery cold) to check out how things are doing in the wind, and do a bit of organizing. 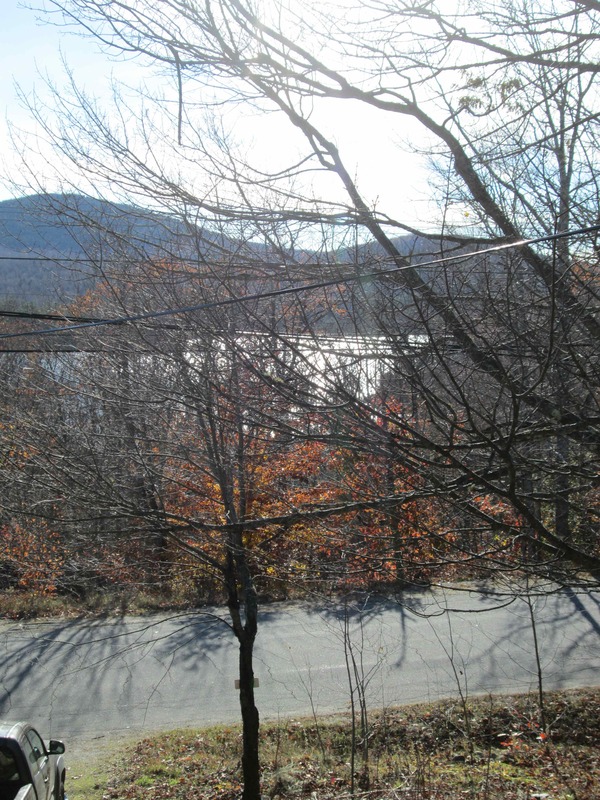 We also took a lovely walk and these photos from behind the house. …and, we brought the door home to work on it here where it’s warmer. More on that (saga) soon. Though we didn’t finish the pesky door project (next weekend, I swear! ), we did do some buttoning down this weekend. We covered up giant holes in the floor with plywood, and also started putting screws in that hold the metal roof to the fascia. You actually can hardly see the screws, which is great because I was worried they would cheapen the look of the roof. 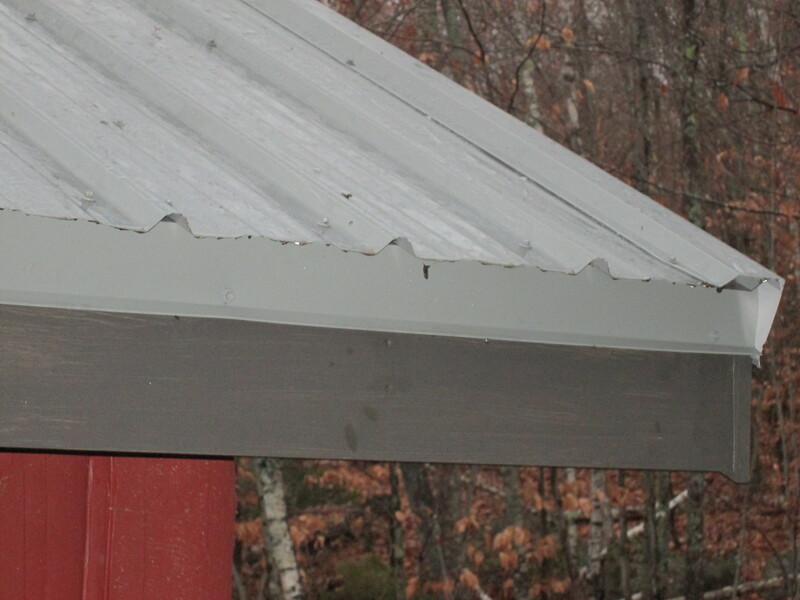 Fascia is as painted as it’s going to be before the snow flies, and we didn’t want to leave the roof edges hanging in the Maine winter. In active rain, no less! Look at that drip edge go! 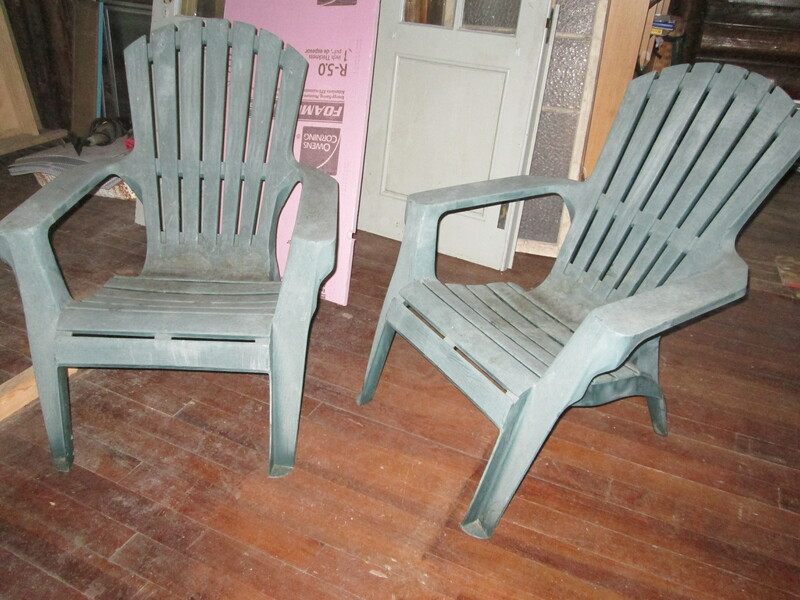 We also snagged a couple of plastic Adirondack chairs (nice ones – first generation, before they got so cheap that they break the second time you sit on them) in a trash pick last week. They are now standing in for indoor furniture. We won’t put any real furnishings in until we are done with major mess-making operations. It’s always good to have free items from the trash to use, then put them back out in the trash when you’re done. Trashes to trashes, dust to dust…or something like that. Comfy(ish) temporary living room chairs. The finest molded plastic. Sun-kissed weathered finish. Not much progress this week – we did check the settling, and it looks good. We also got rid of more bricks (the last of the whole bricks! Just a pile of rubble left). Someone wanted the last 30 or so whole bricks for a project, and we gladly obliged. Besides being able to see more of the ground, where those pesky bricks were piled, we can also see more of the lake now that the leaves have mostly gone. A nice feature of the cold weather, along with virtual obliteration of bugs! This is about the time of year we first saw the cabin – it’s hard to believe it’s been a year since we started on this trip.